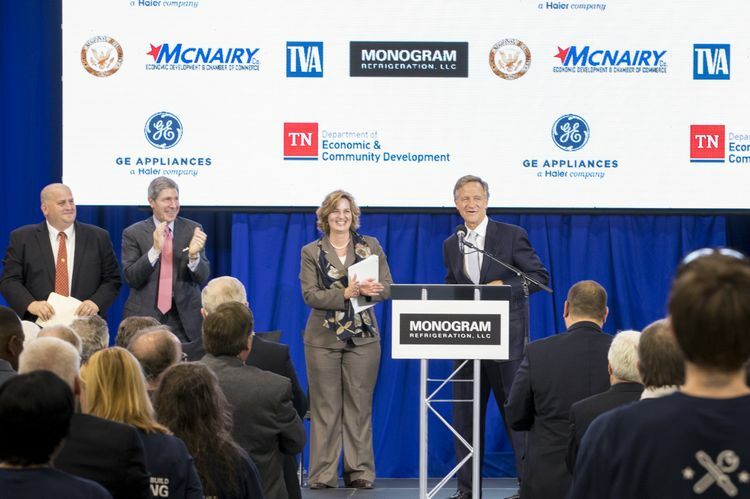 GE Appliances Chief Operating Officer Melanie Cook (left) and Tennessee Governor Bill Haslam (right) greet employees and guests at the opening celebration of two new assembly lines at Monogram Refrigeration, LLC in Selmer, Tennessee. The new lines are producing Monogram® Column refrigerators and packaged terminal air conditioners for hotels under the Zoneline® brand. GE Appliances invests $9.3 million in its Tennessee manufacturing plant; adding two new assembly lines and 210 new jobs.